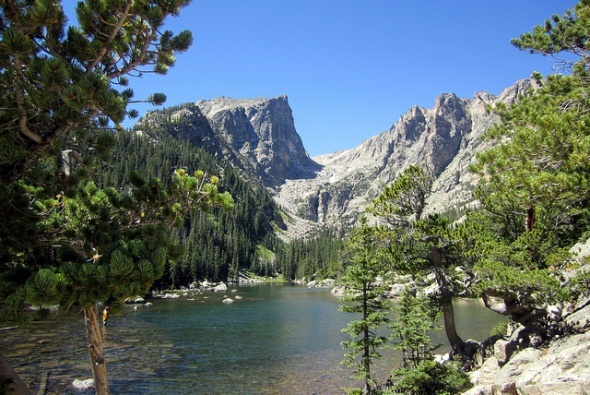 Rocky Mountain National Park, the “park in the sky,” welcomes 3 million visitors a year and has just about everything — mountains, wildlife, hiking and climbing, camping and fishing, stunning scenery. Only 65 miles from Denver, it is reachable and accessible all four seasons of the year. And the weather can change so quickly that sometimes visitors can experience all four in just one day. The park covers 415 square miles at elevations from 8,000 feet in the valleys to 14,259 feet atop Longs Peak. Rocky Mountain was the 10th national park to be designated in the United States. Enos Mills of Estes Park first proposed the designation in 1909, and it was signed into law in 1915 by President Woodrow Wilson. A year of major celebrations greeted its centennial in 2014-15.
about mountain lore. Later he bought their ranch and renamed it the Longs Peak Inn. • Trail Ridge Road, the highest continuously paved road in the United States, which crosses the Continental Divide and reaches elevations up to 12,000 feet, offering some of the world’s most spectacular views. The 48-mile highway from the park’s eastern gate near Estes Park to Grand Lake, west of the park, usually opens by Memorial Day and stays open in the fall until conditions dictate otherwise. Eleven miles of the road are above treeline at 11,500 feet, where visitors can experience alpine tundra. Milner Pass marks the Continental Divide. • Fall River Road, a one-way dirt road, is the original auto road over the mountains. It is open only in the summer and features a narrow roadbed and very tight turns with steep drop-offs and no guardrails. It joins Trail Ridge Road about nine miles up at Fall River Pass. • Bear Lake, a gorgeous alpine lake, is reachable by car or by shuttle when traffic is heavy. A trail around the lake provides a relatively easy hike through the forest with interpretive signs. It is also handicapped accessible. A number of lengthier and more difficult trails are accessible from the area. • Wildlife, from enormous elk and an occasional moose, downward in size through bighorn sheep, mule deer, beaver and marmots, even an occasional bear — the park teems with animals to watch. Many of the critters are more easily seen early in the day, and often at a distance. Bring your binoculars. Birds to watch are also numerous, and the park is a designated Globally Important Bird Area. Check the National Park Service website for help in planning a trip. Be careful out there. For more advice check the park’s website. • Beaver Meadows Visitor Center, three miles west of Estes Park on U.S. 36. Films on the park and a large topographical map, a bookstore, rangers to help plan activities. Handicapped accessible and family restrooms available. Open year-round. • Kawuneeche Visitor Center, on the west side of the park, one mile north of Grand Lake on U.S. 34. Ranger walks, illustrated programs on Saturday night, a film on the park and a topographical map of the park, Bookstore, campsite reservations, handicapped accessible restrooms. Open year-round but hours vary seasonally; closed Christmas day. • Fall River Visitor Center, five miles west of Estes Park on U.S. 34. Exhibits on wildlife and special hands-on exhibits for kids. Handicapped accessible and family restrooms. Restaurant and gift shop nearby. Open year-round, but only weekends and certain other days in the winter. • Alpine Visitor Center at Fall River Pass, Trail Ridge Road and Old Fall River Road, with views of alpine tundra and the Fall River Cirque, a bookstore, gift shop and snack bar. Open only if Trail Ridge Road is open. For more information on visitor center hours and availability, check the park’s website.